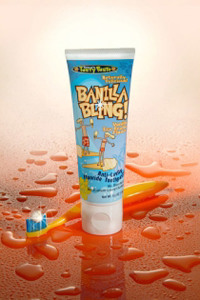 Banilla BlingI took my boys to the dentist on Monday. Before the dentist cleaned each child's teeth, he asked what flavor he liked. My oldest got his teeth cleaned with bubble gum flavored toothpaste. My youngest got his teeth cleaned with marshmallow flavored toothpaste. This experience left me wondering why there weren't more flavored toothpastes being sold. We've seen bubble gum flavored toothpaste at the stores before but never marshmallow. So, I'm walking out of the dentist office and I stop at the desk to make sure that my insurance information is good when I see tubes of weird looking toothpaste on the check out desk. It looks weird because I've never seen this toothpaste in the stores before. I look closer and pick up the first one; it says it vanilla ice cream flavored. Then I picked up the next one; its vanilla and orange ice cream (creamsicle) flavored. My kids tasted it and then smiled ear to ear. Its a big hit so I buy a tube of it and walk out. When I get into the car, I read the tube closely. It contains no saccharin and no sodium lauryl sulfate (SLS). I don't know if you know but there is a lot of stuff out there that says SLS is bad for you... its suppose to be a carcinogen among other problems. So the lack of saccharin (which is also bad for you) and SLS is a huge plus in my book. Baby Bling - flouride free with a mild vanilla ice cream flavour. Even if you don't care about the health benefits of buying this product, you should check it out because it tastes good. If it tastes good, it will encourage your child to brush their teeth more. If they brush their teeth more, the less likely it will be that they get cavaties. The less cavaties your child gets, the more money in your pocket. If you want more information, go to Amazon here. I hope this gets to the right person as I have never done this before! I just wated to respond to your blog about the Swiss Strolli Rider, as I actually have one. I bought it in the UK when I was over and it is excellent. Firstly, my son was 2, and I agree that 15 months may be a bit young, but he had just turned 2 and I am was very confident with him on it. Secondly, you do have to take it off when you put your stroller in the car, but it takes a matter of seconds, and is well worth it for the hours of "non-whining" it brings when I am out at the mall. Thirdly, it is very easy to push and I take it through all the stores in the mall with no trouble at all. My main problem is people asking me what it is and where I got it from. Finally, it really is a fantastic invention and has saved me from those stressful times out when my son is too tired to walk but too 'old' to ride in a double stroller. If you want the solution to the age old moaning toddler, this is it. So I hope I answered some of your questions! Thanks for your great fredback. This is awesome to get someone who tried it to review it so thorouoghly.